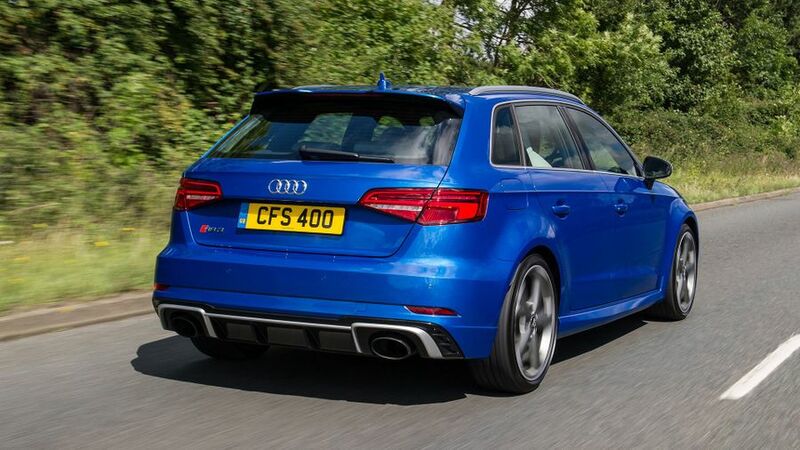 The Audi RS 3 is pretty much the fastest and most powerful hot hatch available, which gives it some real appeal. However, it’s also one of the most expensive, and more critically, one of the least engaging and exciting to drive. There’s no denying how fast you can go in it in all weathers, but the nose-heavy handling and numb steering mean it’s nowhere near as engaging as the best hot hatches, many of which are thousands cheaper. 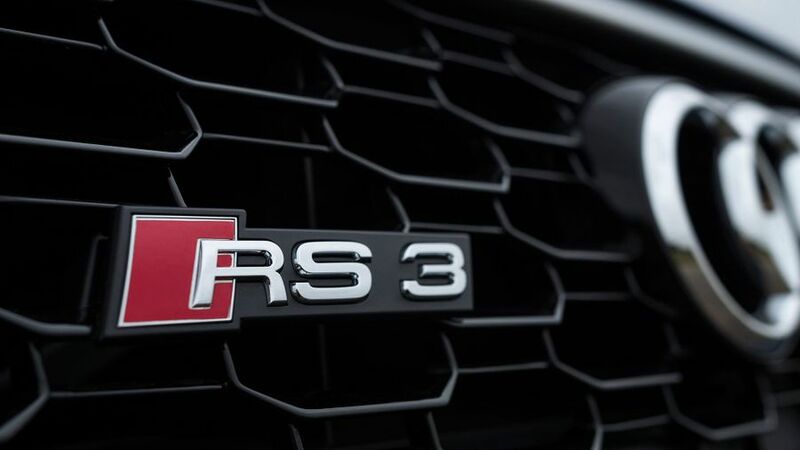 Just one glance at the RS 3 is enough to tell you that this is a very high-performance A3. Not only is the car wider and sits lower to the ground than the regular A3 Sportback it’s based on, it’s also positively overloaded with features that will earn you lots of ticks in the 'I Spy' book of hot hatches. There’s the unique RS bodykit, for a start, featuring extended side sills, a honeycomb grille, and spoilers front and rear. Then, to top it off, the car has aluminium-look door mirrors, twin oval tailpipes, and LED lights all-round. The standard 19-inch alloy wheels are gleaming silver, but there are some attractive alternatives on the options list, and they contrast with the black (or, as an option, red) brake calipers you can see through the wheels. Likewise, you’ll almost certainly need to see the options list for an alternative to the one standard colour: Nardo Grey. 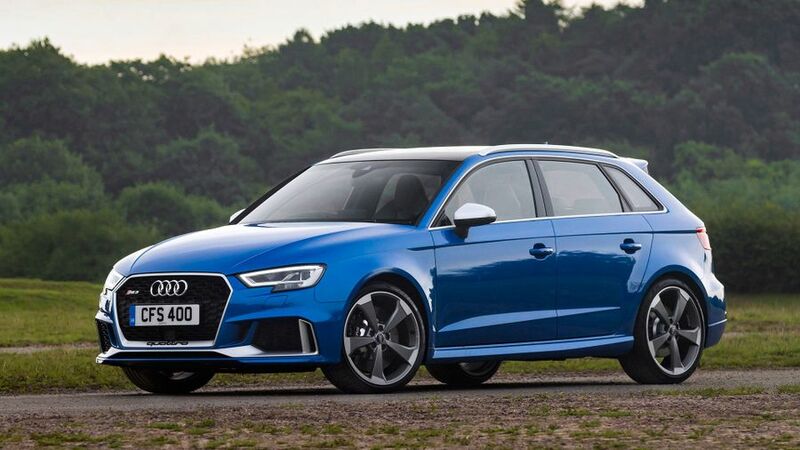 One thing worth remembering is that the RS 3 is now also available as a saloon (dealt with in a separate review), and that body style – which is longer and lower – may look a little sleeker and more attractive to some eyes than this hatchback. Inside, too, there’s no mistaking this is a cabin from the range-topping version of the A3. Open the door and you step over aluminium door sills to see plenty more aluminium-look bits and pieces all over the cabin, as well as a leather and Alcantara flat-bottomed steering wheel and Nappa leather upholstery on the front sports seats, complete with embossed RS 3 logos. Then, there are the more subtle touches, such as the RS logo and boost gauge on the rev counter dial. 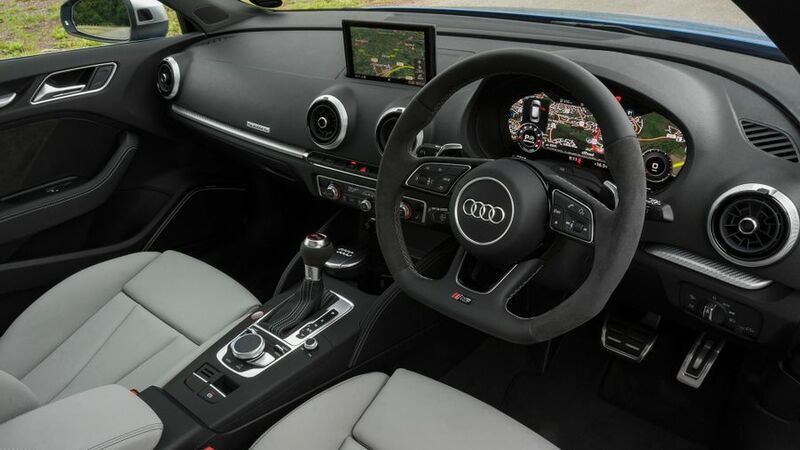 As ever in any A3, the materials and build quality are superb, and the driving position excellent, with a wide range of adjustment on the driver’s seat and steering wheel. 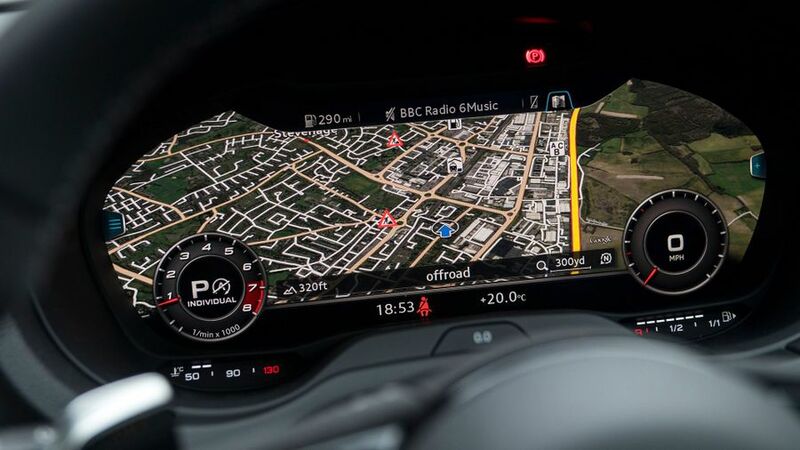 Audi’s ‘Virtual Cockpit’ (which replaces the traditional dials and instruments with a 12.3-inch fully digital and customisable display) is standard, but easy to use once you get used to it. Similarly easy to use is the MMI system that controls the infotainment system through a dial and buttons on the centre console, although isn’t quite as neat as BMW’s iDrive system. This is one place where the RS 3’s roots in the A3 Sportback pay real dividends. Not only is there impressive head- and leg-room for a couple of adults in the front, it’s not too hard to fit another couple of six-foot adults in the rear in comfort. 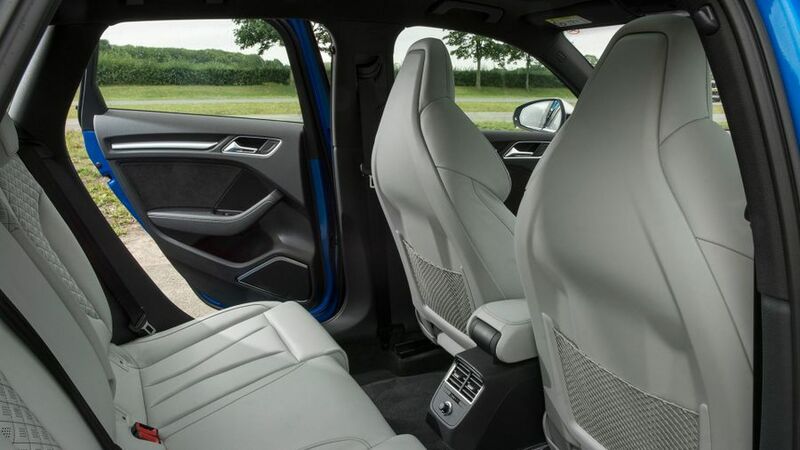 Mind you, the RS 3 isn’t all that comfortable for five, because the large transmission tunnel in the floor limits the foot space for whoever is lumbered with the narrow middle seat. Still, the boot is reasonably impressive, expanding from 280 to 1120 litres when the standard 60/40 split rear seats are folded down. They don’t sit completely flat, but at least there’s no lip in the floor, and the boot’s wide opening, square shape and low sill make it easy to load and unload. As you would only expect of a car that is set up to go quickly and drive in a sporty way, the RS 3 does have a firm feel to its step. However, it’s far more comfortable than you might expect of an uber-powerful hot hatch. What’s more, it achieves this comfort while still providing fine body control – and that’s with the standard suspension set-up. To make matters worse, the steering gives you virtually nothing in the way of weight, feedback or engagement, and the brakes are short on feedback through the pedal (although more than up to the job of stopping such a quick car). As a result, the RS 3 will leave you feeling cold – which is very disappointing from a car that promises so much on paper. If there’s a star of the show in the RS 3, it’s the turbocharged 2.5-litre five-cylinder engine that produces an amazing 400PS. 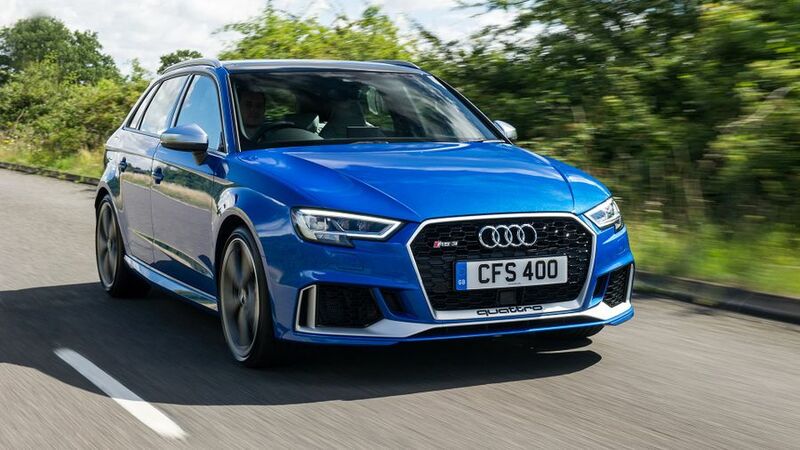 Mind you, when you first pootle away in the RS 3, it’s so benign and smooth – especially in combination with the standard seven-speed S tronic semi-automatic gearbox – that there’s not even the slightest hint of what awaits you when you get the chance to floor the throttle. When you do, you experience the kind of acceleration you’d expect only supercar owners can understand. Holy Cow, this car is fast. Astonishingly fast. Because its peak pull comes at just 1,700rpm, not only is it tremendously easy to drive fast, it’s also amazingly responsive. 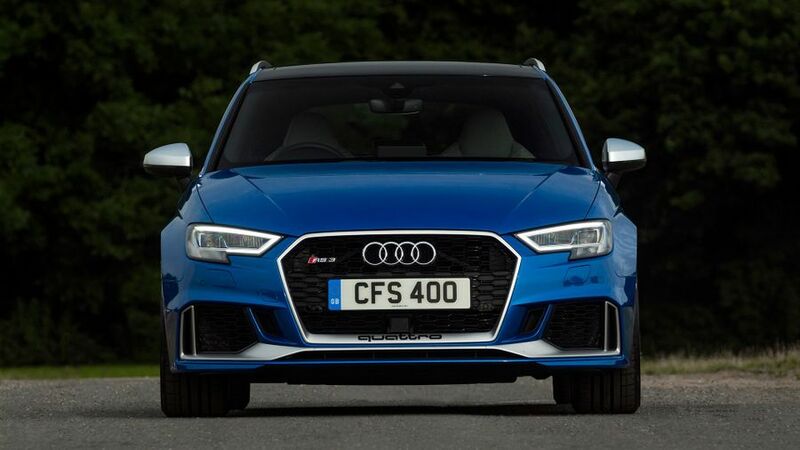 Combine all that with the benefits of four-wheel drive traction, allowing you to accelerate very early after a corner, even in very wet conditions, and there’s precious little that can keep up with a hard-charging RS 3 across country. The one thing we would say, though, is that having at least the option of a manual gearbox might appease enthusiasts after a bit more engagement – even if that means doing a bit more legwork in town. The Audi’s fuel economy and emissions are also worse than its rivals’, but if you’re considering a car like this, economy probably isn’t your number one priority. And, the Audi does have one saving grace; its residual values are forecast to be stronger than those of most rivals, such as the BMW M2 and Mercedes-AMG A45, meaning its whole-life costs will be more competitive. 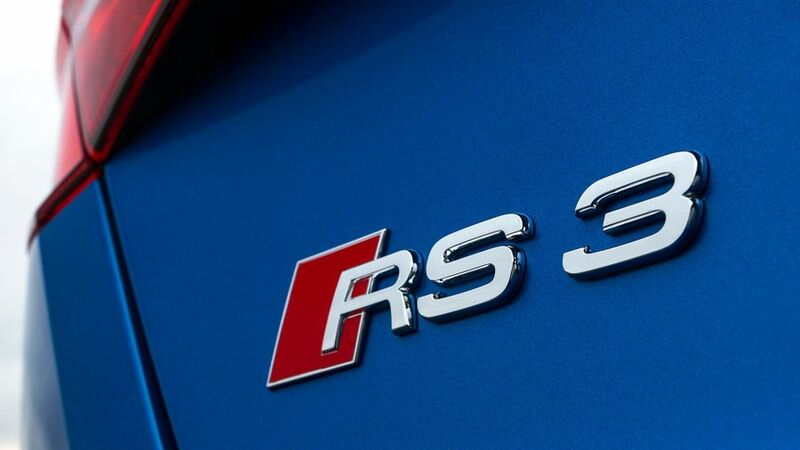 However, the RS 3 will be pricier to maintain and service than the more workmanlike versions of the A3 family. The only version of the A3 Sportback to be crash-tested by safety experts Euro NCAP is the hybrid e-tron model, but that scored a maximum five stars in tests in 2014. 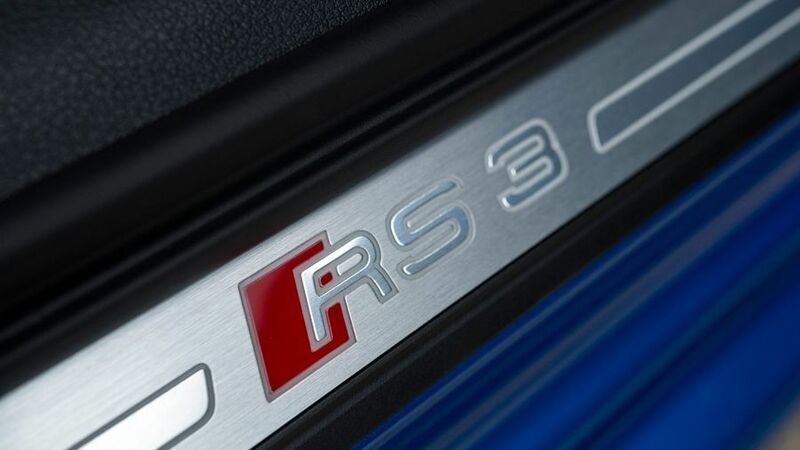 We expect the RS 3 would score just as well if it was to be tested today. It comes with an impressive array of standard safety kit – seven airbags, including one for the driver’s knees, as well as Electronic Stability Control and an Electronic Differential Lock – and there are plenty of options available, too. These include Audi’s Lane Assist and Side Assist packages, as well as Adaptive Cruise Control, all of which are available together in the optional Driver Assistance Pack. 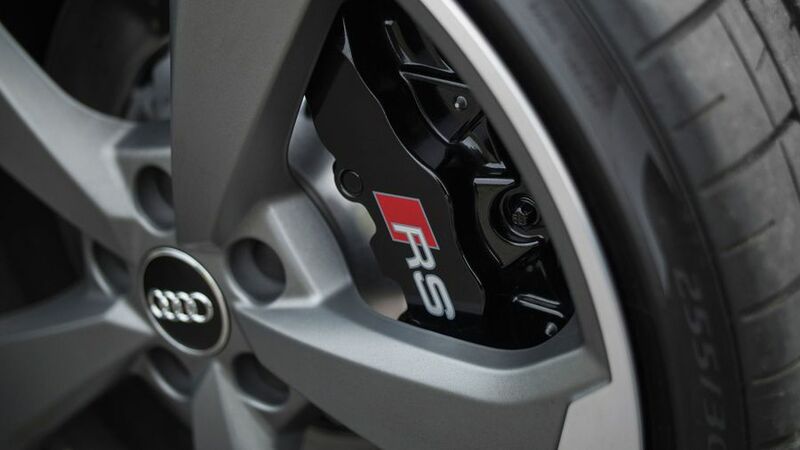 As befits the flagship model in the A3 Sportback range, the RS 3 comes with plenty of standard equipment. On top of its unique bodykit and sports suspension, you get luxuries such as dual-zone climate control, heated front seats, DAB radio and Bluetooth connectivity. Beyond that, there’s a huge range of options, but among the most tempting are the Magnetic Ride suspension, the Comfort and Sound Pack (with an uprated Bang & Olufsen stereo and rear-view camera) and enough styling tweaks to be able to make your RS 3 almost unique. Get carried away, though, and you might be surprised by just how much those options cost when totted-up, so it's best to choose them wisely. The RS 3 is immediately attractive because it’s both the ultimate version of the A3 and the cheapest RS model on the market. On top of that, it’s also very, very fast – and very easy to drive very fast – and demands no sacrifice in terms of quality or practicality over the standard A3 Sportback. If you’re looking for the ultimate hot hatch, though, look elsewhere, because the RS 3 is nowhere near as engaging to drive as several cheaper rivals.